Calculating the heart rate from the ECG is easy. Just count the number of large squares between two complexes on the rhythm strip and divide that number into 300. Again this is straightforward. 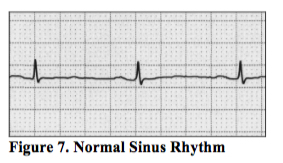 If there is a single p wave corresponding to each QRS with a broadly similar PR interval for each complex (as with the example shown above), it is likely you are looking at normal sinus rhythm (figure 7). If there are no p waves visible and the distance from each QRS to the next varies unpredictably, it is likely you are looking at atrial fibrillation (figure 8). The baseline may show fibrillation waves, which are chaotic. They may occasionally look like a p wave, but not consistently. There will be more on this in later chapters. If there are no p waves visible before each QRS, but there exists a regular interval between each QRS there are several possibilities. Firstly, this may be a junctional rhythm, arising from the AV node or high up in the His-Purkinje system close to the AV node. Conduction occurs both forwards and backwards into the atria and ventricles simultaneously if AV nodal function is normal. If so, you may see ‘retrograde’ p waves visible within the QRS. Sometimes, however, retrograde p waves are not seen, and this usually means the p wave is buried within the QRS.